Agana to Maslinica - 7 nm. Your Agana itinerary begins on the day you arrive at the base. Once you check in, purchase provisions (if you haven't elected to have us do it for you), and receive your pre-cruise chart briefing, board your yacht at 3:00 P.M. and get under way for a short sail to the southeast, where you'll find the charming island of Solta off the bustling port of Split. Beyond are the much larger islands of Hvar, Vis, and Brac, each with a variety of harbors to explore. As you approach the western side of Solta, a series of picturesque islets spreads across the sea off the bow. The small harbor of Maslinica comes into view, lush with stands of olive trees (maslina means olive). Ashore are a number of taverns, cafés, and shops. You can also anchor in the adjacent bay of Sesula. Mooring: No moorings are available. You can tie up at the pier in the harbor of Maslinica or you can anchor in the adjacent bay of Sesula. Dinghy dockage: No dinghy dockage is available. Things to do: Going ashore to walk through the village of Maslinica to browse in the shops and dine at one of the traditional Croatian taverns is a pleasant way to spend a late afternoon or early evening. Renting a bicycle to tour the island is delightful. The oldest settlement is Grohote, the main town on the island, is well inland but worth seeing for its scenic and rural beauty. Relaxing and taking a refreshing swim at one of the many beaches is a good way to experience the quiet ambience of Solta. The most popular beach is Necujam. Maslinica to Vis Town - 21 nm. Setting sail from Solta, plot a course nearly due south to the lovely island of Vis, a very popular tourist destination with beautiful beaches and lively nightlife in Vis Town. As you reach the northeastern end of Vis, you'll see Stonica Bay, where you can relax and take a refreshing swim. Not far is historic Vis Town, established in 397 B.C. Ashore are ancient ruins, monasteries, churches, a Roman amphitheater, and even a palace to explore. Vis is a large, rugged island, but it's also home to more than 500 varieties of herbs. In springtime, the air is fragrant with the rich scent of rosemary and sage. Mooring: No moorings are available. There is ample room to anchor in the bay off Vis, but most sailors tie up at the piers. Things to do: Walking through Vis is a pleasant way to see the sights. Everything is relatively close, so there's no need for taxis or bicycle rentals. At the far western end of the bay is the ancient Greek settlement of Issa on Gradina Hill. It's definitely worth a look and the views are splendid. There's an ancient necropolis and the ruins of a Roman amphitheater to explore. In the old section of town on the south side of the bay are several intriguing 16th and 17th century churches as well as Garibaldi Palace. Also in Vis Town is the Vis Archaeological Museum, which has a fabulous collection of artifacts from local digs, including the bronze likeness of a Greek goddess (actually, just her head!) made in the 4th century. Ambling the narrow lanes and public squares of Vis Town to browse in eclectic shops and to dine at the cafés and restaurant is a delight. While you're in Vis Town, be sure to sample some of the domestic wines produced from the grapes harvested at the island's many vineyards. The ruby-red Plavac is refreshing. Vis Town to Komiza - 11 nm. The third day of your Agana sailing itinerary takes you along the coast of Vis to the picturesque fishing village of Komiza, with a stop at Tiha cove for lunch and a swim. As you get under way again and continue sailing the Vis coast, the forests of pine extend to the shore in places. The distinct and pleasant scent of the pines carries to you on the warm breeze filling your sails. Inland are extensive vineyards, which produce excellent domestic wines, including the dry white Vugava and the red Plavac. 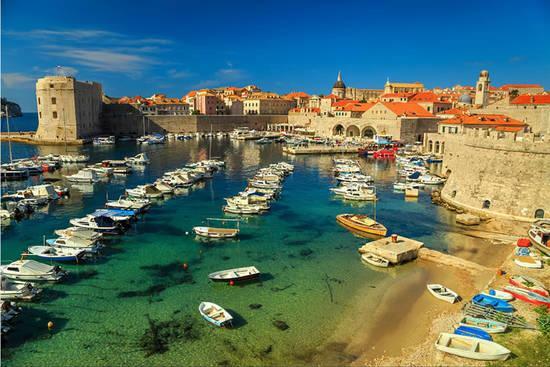 Sailing among Croatia's Dalmatian Islands is a bountiful treat for the senses. Mooring: No moorings are available. It's best not to anchor in Komiza because of its small size and the commercial traffic (fishing and tour boats taking sightseers to the Blue Cave on Bisevo). Most sailors tie up at the breakwater, which is fitted with mooring lines to make it easier to secure your yacht. Things to do: In about the year 1250, the Benedictine monks living at the monastery on Bisevo Island, five nautical miles southwest of Komiza, moved from the tiny island to a brand-new monastery east of the present-day town. This fostered the further development of this beautiful small bay, and it has been a fishing harbor ever since. Taking the time to explore the monastery is a delightful walk, as is a sojourn to the citadel (circa. 1585) at the head of the main wharf. You can also take a sightseeing boat to the Blue Cave of Bisevo, a natural wonder of the Dalmatian Islands famous for its beauty. 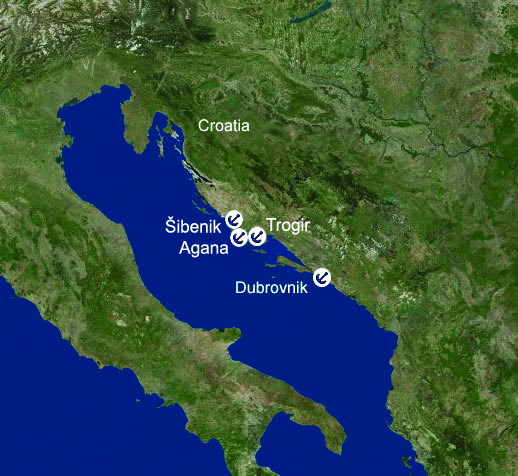 The waters of the central Dalmatians are littered with shipwrecks, prompting many of Croatia's dive clubs to organize guided underwater tours. Diving is restricted in Croatia, but you can easily arrange an expedition to the reefs, caves, shipwrecks, and the Blue Cave! In the evening check out the open-air nightclub on Kamencia Beach. Facilities: Dockage, water, and electricity are available. Komiza to St. Clement Island - 23 nm. After leaving Komiza, sailing 5 nautical miles to the southwest brings you to the islet of Bisevo with its ten wondrous caves and rocky shores. Taking some time to enter the famous Blue Grotto (Cave) in a local tour boat is a sojourn into exquisite beauty. At midday, the angle is right to channel sunlight through an underwater opening in the cave wall that illuminates the interior in shimmering blue. You can swim inside the cave; it's a very unique place to snorkel. Then set a course from Bisevo to the northeast and the beautiful Pakleni Islands just off Hvar Island. The largest of the group is St. Clement, with the splendid Palmizana Cove. There's an excellent marina there, as well as a pristine white-sand beach. Vinogradace Cove is also scenic and inviting. Mooring: No moorings are available. There are numerous anchorages in the coves and bays of the Pakleni Islands. Things to do: Enjoying quiet time aboard, ambling the paths through forested lands ashore, dining at one of the restaurants on the islands, it's all part of St. Clement sailing, a peaceful experience that sooths the soul. On St. Clement, you can explore the famous chapel originally built there in the 1400s (it has gone through several rebuilds). There is also a small museum on the island. If you're interested in a sojourn to one of the most popular tourist destinations in Croatia, hop aboard a water taxi to visit Hvar Town. The medieval architecture, historic sites, boutiques, cafés, restaurants, and nightclubs are intriguing and fun. The scuba diving is excellent in the Pakleni Islands (guided excursions only due to regulations). Facilities: Dockage, water, showers, and electricity are available. St. Clement Island to Hvar Island - 22 nm. The next leg of your Agana sailing itinerary takes you to Hvar Island's north shore. Just past Cape Pelegrin is beautiful Parja Cove, where you can stop for lunch at the beachfront restaurant. Continuing your sail eastward along the north coast you pass Vrukova Cove, another scenic place to linger. As the afternoon wanes, make your way to Vrboska Cove with its small port town and first-class marina. The village looks like a miniature Venice with stone buildings and a picturesque, multi-arched stone bridge across the narrow inlet at the head of the harbor. Pine forests crowd the steep hills on either side. Ashore are some excellent restaurants. An alternative choice would be to spend more time at St. Clement or at the other Pakleni Islands and take a water taxi to nearby Hvar Town, which is known for its historic sites and nightlife. Mooring: No moorings are available. There are many secluded coves and bays where you can anchor off beautiful beaches, as well as a number of pretty fishing villages with secure and protected harbors and first-class marinas. Things to do: On the south side of the island, you'll find busy and vibrant Hvar Town. It does have marinas, but they cater mostly to the megayacht crowd. To visit the town it's more convenient (and less costly) to secure a berth at St. Clement and take a water taxi. Walking the seaside promenade is a good way to experience the chic ambience of Hvar Town. The Renaissance architecture is magnificent. The boutiques, shops, cafés, restaurants, and nightclubs are the main attractions. Far quieter is the harbor of Vrboska, on the northern coast, one of the exquisite delights of Hvar sailing. Exploring the narrow streets, sampling the local fare, and visiting the historic sites is a pleasant way to spend an afternoon. The only true fortress in the Dalmatian Islands is in town, the Church of St. Marija, which the local residents fortified in the late 1500s to guard against Turkish raids. The Fishing Museum is fascinating. You can learn all about the fishing trade in the Dalmatians through the ages. Facilities: All facilities for yachts are available. Hvar Island to Brac Island - 16 nm. Just across Hvar Channel to the north is Brac Island, the third largest island in the Adriatic. More arid than some of the other isles of the Dalmatians, the rocky pine-studded mountains are obvious as you approach the island from the sea. The beauty is stark, the ambience seemingly remote, but Brac is actually quite populated and home to the two big resorts of Supetar and Bol, which hum with activity during the high season (July and August). As you close with the coast, set a course for the small fishing village of Milna, where you relax for the evening aboard or go ashore to explore. Mooring: No moorings are available. There are numerous anchorages in the coves and bays around the island. One of the most spectacular bays is at the small village of Milna. Things to do: Brac sailing is primarily about the beaches, where you can enjoy all manner of watersports. The rocky underwater formations teem with fish and make for excellent snorkeling and scuba diving (guided excursions only due to regulations). The nightlife at Bol is second to none. The port of Milna is well known for its intimate restaurants, quiet ambience, and beautiful beaches. It has a first-class marina. Brac Island to Agana - 19 nm. The final day of your Agana sailing itinerary brings you northwest to Solta waters once again. If you have time and wish to stop for a refreshing swim, the beaches of Necujam or Stomorska are absolutely splendid. Otherwise, push on to complete the final miles of your adventure in the Dalmatian Islands. As the afternoon wind strengthens, the boat speeds across the shimmering blue waters of the Adriatic Sea, the sails full and drawing. Arriving back at the base at Marina Agana by 5:00 P.M., you'll have plenty of time to enjoy dinner at the nearby restaurants, a fitting end to a leisurely foray into one of the best cruising grounds on Earth. Mooring: No moorings or anchorages are available at Agana. The marina is first-rate, modern, and has all amenities. Things to do: The many attractions in Split include the famous Diocletian's Palace, a UNESCO World Heritage Site. Aside from temples and other intriguing structures, it also houses the Town Museum, which highlights Split's history. The museum is very thought provoking and intriguing and will help you place the history of the area into a wider context. The city's Archaeological Museum has a fantastic collection of artifacts from Roman times. There are several outstanding art galleries in Split. Two of them are the Mestrovic Gallery, which contains assorted sculptures, and the Gallery of Fine Arts, which contains a variety of paintings from different periods. Other area attractions include the ancient walled town of Trogir. It is a fascinating place to visit, making you feel as though you have stepped into a time warp to a distant era in the past. The Roman ruins of Solin and the natural wonders of the Krka National Park are just a few of the additional points of interest in the vicinity of Split. Final Morning : After a restful night aboard, disembark from your yacht at 8:00 A.M. and prepare for your flight home. Alternatively, you could take several days to visit the cosmopolitan and historic city of Split. Excursions from the base are available to Split and other intriguing sites, including the magnificent waterfalls at Krka National Park.